FuelMy Blog and lastminute.com invited 300 words describing an ideal weekend in a competition, the prize for which is business class travel to “the continent” – but for UK residents only (it did sound too good to be true). No matter, it was an interesting challenge. No doubt competitors will write in anticipation of an ideal weekend. I thought I would try something retrospective. Just for the heck of it. The Atherton Tablelands, lifted above the blue tropical heat of the north Queensland coast. An old plywood caravan sitting on blocks on a blanket of pineneedles. In a whispering pine forest that gently fell to the banks of Lake Tinaroo, the water barely glimpsed. It is the only caravan in the forest. At the front step a circle of stones in which the fire is lit. There is no electricity. The children are toddlers and run free though not far. It is getting dark. The circle of stones fascinates them but more so the fire that soon crackles in it. A child gathers twigs. The others are content to be mesmerized by the fire. Dinner is had on nightfall, from a sticky frypan. Moving shadows beside us draw our attention to a possum which inches towards the fire and sits in the circle with us, part of the family. The boy is fascinated and flicks him some food. The girls are asleep. The sun has been sunk less than an hour. They are tucked into bed. We sit for a short while gazing into the fire until we can hardly keep our eyes open. So we repair to the caravan. The possum stays where he propped and watches us leave. The June air is fresh and cool but the van is snug and warm. Asleep in seconds at a time of the night we would normally be busy with work or study or children. The next conscious moment is dawn when we wake with the sun. Two days worth. No phones. No traffic. Long companionable silences. Glittering Milky Way. Cool air. No distractions. No clocks. No people. Just the family. 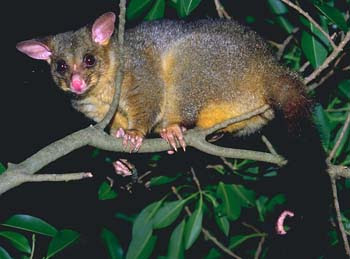 And one possum. Perfect.